A simple, yet perfect touch to brighten up any occasion, these LED battery-operated luminaries provide a warm flickering light - just like a real candle! Ideal and safe for home decor, restaurants, or any indoor/outdoor event. 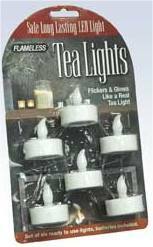 Attractive Clamshell package holds 6 all White Tea Lights.